When Facebook launched in 2004, CEO Mark Zuckerbeg couldn’t have imagined that his fledgling social network would one day build a solar-powered plane that would beam Internet connectivity to remote areas. That’s happening right now: It’s called Aquila, and it flys 60,000 feet above the ground for months at a time to connect the world. This plane is part of Zuckerberg’s vision for the next year. But he also has incredibly specific long-term goals, like this one: In 10 years, virtual reality headsets like Oculus Rift will look like your average pair of prescription glasses with the ability to view VR worlds and augmented reality overlays at the same time. Zuckerberg outlined Facebook’s 1-year, 5-year, and 10-year roadmaps during the opening keynote of F8, the network’s annual developer conference. Facebook’s highest priorities are virtual reality, artificial intelligence, and bringing Internet connectivity to the entire globe. A rendering of what Facebook’s VR/AR glasses will look like. The company is obviously hyper-focused on VR right now, with the Rift’s consumer release last month and the launch of Samsung’s more affordable Gear VR headset late last year. But right now, the headsets are used primarily for gaming. Facebook has bigger plans. Zuckerberg said the company is working on social experiences for VR headsets that will let Facebook users hang out in virtual spaces. Right now, that experience looks pretty rudimentary, with avatars representing real people playing simple games. But Facebook is dreaming up a richer landscape to bring your social network to life. The company is also envisioning the day when VR headsets like the Rift are glasses that offer virtual reality worlds and augmented reality overlays in one device. It’s “going to take a long time to make this work,” Zuckerberg said. Facebook uses artificial intelligence to determine which stories to show you in your News Feed, but that effort is pretty low-tech compared to what Facebook is working on. Chat bots in Messenger can help you stay informed. Zuckerberg thinks AI will eventually be able to diagnose diseases based on photos you upload. But today, AI is coming to Facebook Messenger. Facebook launched Messenger Platform so developers can build AI-powered chatbots that you can converse with when you need information. It’s particularly useful when you want to avoid dealing with businesses on the phone. Companies will use Messenger in different ways. 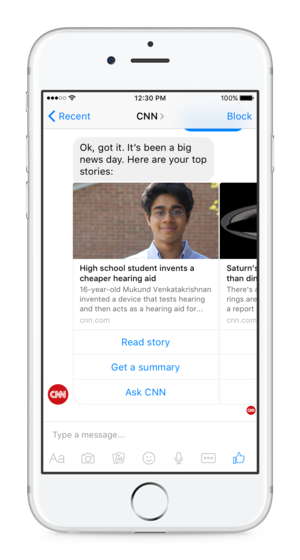 CNN can send you news headlines and you can send a message to read the full story, get a summary of the story, or ask CNN questions about it. If you want to send a bouquet, 1–800-Flowers is using Messenger to show you floral arrangements and let you place an order without having to actually call 1–800-Flowers. The future is now. Connecting the world requires scale, which Facebook has already achieved. Every time Zuckerberg speaks in public, he talks about Facebook’s mission of connecting the world. That mission includes Aquila, the solar-powered Internet delivery plane. It also includes a satellite the company is launching in space to connect sub-Saharan Africa. Facebook also has plans to improve connectivity on the ground in rural and urban areas with two systems it will dive into tomorrow, Aries and Terragraph. The company is still committed to its Free Basic program, which has run into opposition in countries like India, where the program was banned for running afoul of net neutrality tenets. Facebook just launched a Free Basics simulator so developers can build apps that will help people access the Internet in areas with spotty connectivity or none at all. The company is also building open-sourced infrastructure for telephone companies. “The idea is if we can make it cheaper for telcos to operature their mobile infrastructure, then some of those savings will be passed on to people in the form of lower data prices,” Zuckerberg said. If F8 is any indication, Facebook has grand ambitions. Some of Zuckerberg’s big plans, like the VR/AR glasses, require the company to scale products like Rift to a large audience before creating an ecosystem around them. But unlike many companies, Facebook actually has products with more than 500 million users. Facebook itself has more than a billion users. It has reached scale many times over. Its plans for the next decade don’t seem so crazy.